Peranakan cuisine or Nyonya cuisine comes from the Peranakans, descendants of early Chinese migrants who settled in Penang, Malacca, Singapore and Indonesia inter-marrying with local Malays and combines Chinese, Malay and other influences. The old Malay word nonya (also spelled nyonya), a term of respect and affection for women of prominent social standing (part "madame" and part "auntie"), has come to refer to the cuisine of the Peranakans. Nyonya cooking is the result of blending Chinese ingredients with various distinct spices and cooking techniques used by the Malay/Indonesian community. This gives rise to Peranakan interpretations of Malay/Indonesian food that is similarly tangy, aromatic, spicy and herbal. In other instances, the Peranakans have adopted Malay cuisine as part of their taste palate, such as assam fish and beef rendang. Key ingredients include coconut milk, galangal (a subtle, mustard-scented rhizome similar to ginger), candlenuts as both a flavoring and thickening agent, laksa leaf, pandan leaves (Pandanus amaryllifolius), belachan, tamarind juice, lemongrass, torch ginger bud, jicama, fragrant kaffir lime leaf, rice or egg noodles and cincalok - a powerfully flavored, sour and salty shrimp-based condiment that is typically mixed with lime juice, chillies and shallots and eaten with rice, fried fish and other side dishes. There are regional variations in Nonya cooking. Dishes from the island of Penang in the northern part of Peninsular Malaysia possess Thai influences, such as more liberal use of tamarind and other sour ingredients. Dishes from Singapore and Malacca show a greater Indonesian influence, such as the use of coconut milk. A classic example is laksa (a spicy noodle soup), which comes in two variants: the sour asam laksa from Penang and the coconut milk-based laksa lemak from Singapore and the southern regions of Peninsular Malaysia. The flavor of laksa and other Nonya recipes is determined by the rempah, which in Malay means spices. The various combinations are pounded into a paste with pestle and mortar, with a very specific texture and density. It is said that a nonya can determine the culinary skill of a new daughter-in-law simply by listening to her preparing rempah with a mortar. Nonya recipes are handed down from one generation to the next, and because of the time-consuming preparation of these dishes, it is a cuisine that is often at its best when served at home. Laksa is a notable exception to this rule. Examples of Nonya specialities include otak-otak, a popular blend of fish, coconut milk, chilli paste, galangal, and herbs wrapped in a banana leaf; Ayam Buah Keluak, a distinctive dish combining chicken pieces with nuts from the Pangium edule or kepayang tree to produce a rich sauce; and Itek Tim, a classic soup containing duck, tomatoes, green peppers, salted vegetables, and preserved sour plums simmered gently together. Nonya desserts include colourful cakes (kue) and sweet, sticky delicacies. Achar - various pickled meats and vegetables like achar keat-lah (honey lime/calamansi), achar hu (fried fish), achar kiam hu (salt fish), achar timun (cucumber), achar awat (mixed vegetables). Asam Laksa (Mandarin: 亞三叻沙). Considered one of Penang's three signature dishes, Asam laksa consists of a bowl of translucent al dente white rice noodles served in a spicy soup made of fish (usually mackerel), tamarind (both asam jawa and asam gelugor), and daun kesum. Toppings differ considerably, and may include onion, mint, chopped torch ginger flower, and slices of pineapple and cucumber. 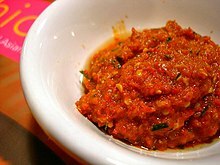 A dollop of pungent, viscous sweet fermented shrimp paste (Petis udang or Hae Ko) is usually served on the side. Ayam buah keluak, a chicken stew cooked with the nuts from the "Kepayang tree" (Pangium edule), a mangrove tree that grows in Malaysia and Indonesia. For this recipe, the contents of the buah keluak is dug out and sauteed with aromatics and seasonings, before it is stuffed back into the nuts and braised with the chicken pieces. Ayam/Babi Pongteh, a stew of chicken or pork cooked with tauchu or salted fermented soy beans, and gula melaka. It is usually saltish-sweet and can be substituted as a soup dish in Peranakan cuisine. Commonly use pork as this is a Peranakan version of Chinese braised pork belly. Babi assam, a pork stew cooked with tamarind juice. This dish is also popular within the Kristang community. Chap chhai, stir fried vegetables. The Nonya version of this Chinese Indonesian classic incorporates tauchu and dried shrimp. Chinchalok, a distinctly Malaccan condiment made of fermented tiny shrimp (udang geragau), salt and rice. It is also a favoured cooking ingredient used by the Kristang Eurasian community of Malacca. Enchi Kebin, deep fried chicken pieces marinated in a paste of coconut milk and rempah (spices). Itik Tim or Kiam Chhai Ak Thng is a soup of duck, preserved mustard greens and cabbage flavoured with nutmeg, Chinese mushrooms, tomatoes and peppercorns. Jiu Hu Char is a dish made up mainly of shredded vegetables like turnip or jicama, carrot, and cabbage and fried together with thinly shredded dried cuttlefish. Kari Kapitan, a Penang Nonya take on the ubiquitous chicken curry. Kaffir lime leaves and coconut milk are among the key ingredients for this mild curry. Kerabu Bi Hun is a salad dish consisting of rice vermicelli mixed with sambal belacan, calamansi lime juice, and finely chopped herbs and spices. Other famous salad dishes are kerabu bok ni (cloud ear fungus/tikus telinga), kerabu ke (chicken), kerabu ke-kha (chicken feet), kerabu timun (cucumber), kerabu kobis (cabbage), kerabu kacang botol (four angled bean), kerabu bak pue (pork skin). Kiam Chhai Bue is a mixture of leftovers from Kiam Chhai Ak Thng, Jiu Hu Char, Tu Tɵ́ Thng and various other dishes. "Bue" literally means "end". Laksa lemak is a type of laksa served in a rich coconut gravy, served with prawns, cockles, lime and a dollop of sambal belacan. Lam Mee is long yellow noodles cooked in a rich gravy made from a stock of prawns and chicken. It is always served at birthdays to wish the birthday boy or girl a long life, and thus it is also known as birthday noodles. Lontong Cap Go Meh is a Peranakan Chinese Indonesian take on the traditional Indonesian dish. Masak titik is a style of vegetable soup that makes liberal use of white peppercorns. One version uses watermelon rind as the main ingredient. Another makes use of green or semi ripe papaya. Mee Siam dish of fried thin rice vermicelli with spicy gravy. Nasi kunyit is glutinous rice seasoned with turmeric powder, coconut milk and asam gelugor. It is usually served with a chicken curry, ang ku kue, and pink-dyed hard-boiled eggs as gifts in celebration of a child of friends and family turning one month old. Nyonya Bak Chang, Nonya-style zongzi made in a similar manner as a typical southern Chinese zongzi. However, the filling is typically minced pork with candied winter melon, ground roasted peanuts, and a spice mix. The blue butterfly pea flower is used to colour the rice with a shade of blue, and pandan leaves are sometimes used as the wrapping instead. Otak-otak is a dish involving fish pieces wrapped in banana leaves. Two very different variations exist: one consists of a mixture of fish pieces and spice paste wrapped in banana leaves and char grilled. Pempek is a dish involving deep fried fish balls. There are many varieties of fish balls, kapal selam has an egg inside the fish ball. At Belitung, the pem-pek is eaten with sambal and lime instead. Pempek Palembang is very popular in Indonesia, the fish balls are eaten with a spicy black vinegar sauce, cucumber, and noodles. Perut ikan - a spicy stew (similar to asam pedas in flavour profile) comprising mainly vegetables/herbs and getting its distinctive taste mainly from fish bellies preserved in brine and daun kaduk (the Wild Pepper leaf is from the Piper stylosum or the Piper sarmentosum). A classic Penang Nonya dish. Pai Ti/Pie Tee is a thin and crispy pastry tart shell filled with a spicy, sweet mixture of thinly sliced vegetables and prawns. Seh Bak - a dish of pork loin, marinated overnight with herbs and spices, cooked over a slow fire and simmered to tenderness. Chuike is a Peranakan frog leg soup dish, popularly associated with the town of Jatiwangi and Purwodadi in Java, Indonesia. Tu Tɵ́ Thng - literally pig stomach soup, this dish requires a skilled cook to prepare and deodorise the ingredients using salt before cooking. Its main ingredients are pig stomach and white peppercorns. Peranakan or Nyonya cuisine are a fusion of food derived from Chinese immigrants to the South East Asia to worked the tin mining boom. Only Chinese men migrated, they marry the local women, who then combined both of the cultures and cuisine. Perankan cuisine almost always have coconut milk with cumin, turmeric, lemon grass, ginger flowers,"Pandan" leaves and other spices. Wikimedia Commons has media related to Peranakan cuisine. ^ Eveland, Jennifer (2007). Frommer's Singapore & Malaysia. Frommer's. p. 98. ISBN 978-0-470-10049-3.